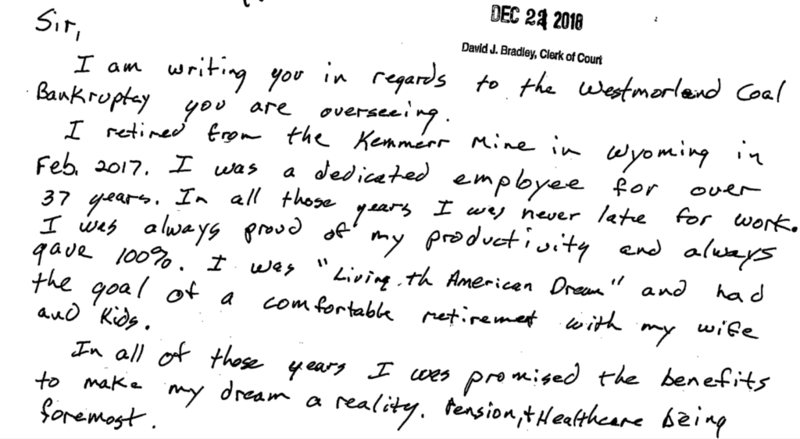 Two years ago, Jim Bills retired from the Kemmerer mine in Southwestern Wyoming. “After spending seven years in the Air Force, I spent 36 years with Westmoreland coal,” he said. Bills worked as a laborer, truck driver, and driller. His son works there now, too. Bills recalls watching retirees taken care of year-after-year. He was excited when his time finally came. “Now my beard turned gray and it was my turn to collect and they don’t want to pay me!” he said. Now, Bills says one medical emergency could wipe away his and his wife’s retirement fund. Last October, Westmoreland filed for bankruptcy protection for the third time. The company had over a billion dollars in debt. It blames a weak coal market for its demise along with admitting it took on way too many loans trying to expand its operations. Mike Dalpiaz, International Vice President for United Mine Workers of America (UMWA) representing all the United Mine Workers in the Western U.S., says this particular mine has been around for over a century. He blames Westmoreland’s bad management. “It’s like a blind man trying to run a coal mine,” Dalpiaz said. A Texas judge granted Westmoreland permission to shed hundreds of millions of dollars in liabilities. Dalpiaz points out Westmoreland gave its executives huge bonuses last year, adding to local anger. “Bankruptcy laws are made for corporations. They’re made by rich guys in Congress for rich guys that own corporation,” he said. Lynn LoPucki, UCLA law professor and bankruptcy expert, said debtors have an advantage over employees because they’re able to choose where to file. In Westmoreland’s case, it chose a Houston court despite its Colorado headquarters. “The situation you have now is that courts literally compete for the bankruptcy cases. The courts are changing what they’re doing, which I have said is corrupting,” LoPucki said. Houston is the third most common city for bankruptcy cases. The top two are in Delaware and New York -with nearly 60 percent of cases taking place there in the U.S.
“The way that they attract the cases is by making the kinds of rulings that are attractive to the people who can bring the cases. Management is central to that. So, they’re the people who tend to be taken care of in bankruptcy cases,” LoPucki said. A bill has come up repeatedly in Congress to end forum-shopping. A staffer for Massachusetts Senator Elizabeth Warren said the legislator is planning to reintroduce the bill this Congress. Westmoreland’s lawyer Michael Slade said it’s bankruptcy code that obligated the company to negotiate with the union in good-faith. He said it’s helped create solutions and that it wasn’t always like that. “If this had happened in the late ’80s, I think what you would have seen is a prompt rejection of all these obligations with nothing flowing to the retirees and to the employees,” Slade said. He added Westmoreland has been fighting hard for their workers and retirees, but it’s an unfortunate climate for coal right now. Slade said it shouldn’t be taken for granted that Westmoreland worked hard to maintain worker’s pension plans. Debtors also are providing a year’s worth of healthcare benefit payments. He said it’s in everyone’s interest for the company to get solvent. The years-worth of benefits would help transition workers into a long-term congressional health care plan. The American Miner’s Act of 2019 has yet to be approved. It’s just the latest version of a bill aimed at helping coal workers. The Kemmerer Mine in Wyoming will soon be getting a new owner: billionaire executive Tom Clarke. Many doubt the mine’s future profitability though the power plant next door already has dates set to retire two more coal-fired units. UMWA’s Mike Dalpiaz said the fight for benefits is far from over with new collective bargaining agreement negotiations underway.